The first four #WCOOP champions were crowned on Monday at PokerStars. Get the full Day 2 recap here. Four of the 81 events in the World Championship of Online Poker (WCOOP) at PokerStars are in the books, with another three events beginning on Tuesday. Thus far, Russia's "KumariOy" is the biggest winner of the festival after taking down the WCOOP-03-H: $1,050 NLHE [Sunday Million SE], $1.5M Gtd, which featured a star-studded final table, for $310,290. With the win, "KumariOy" now has two COOP titles after previously shipping the SCOOP-07-H: $700 NL Hold'em [Heads-Up], $250K Gtd in May 2013 for $80,354. The $1.5 million posted guaranteed prize pool was smashed with 2,074 entrants ponying up the $1,050 buy-in to generate a massive $2,074,000 prize pool. The final table began after Mark "AceSpades11" Radoja was eliminated in 10th place for $14,750. According to the PokerStars Blog, American poker refugee Bryn "BrynKenney" Kenney, who is currently in the top spot in both the 2017 GPI Player of the Year and overall GPI World Rankings leaderboards, began the nine-max table with the chip lead with two players from Russian in Denis "NEWFlat" Timofeev and "KumariOy" on his heels in second and third places. 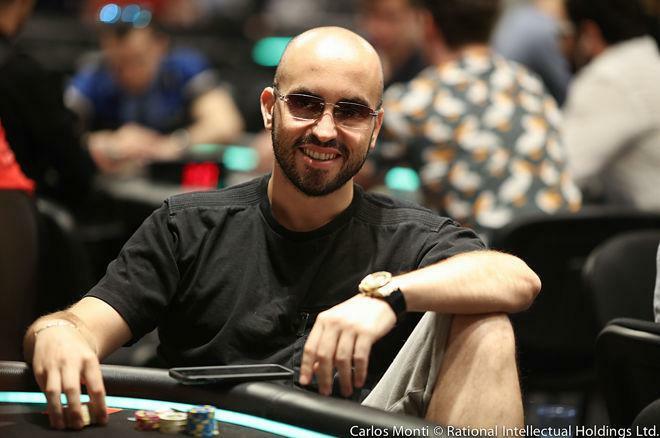 "KumariOy" took over the chip lead after he eliminated Costa Rica's Paul "pochi" Cukier in ninth place for $19,393 when his pocket aces held against his opponent's pocket sevens. Shortly afterward, Kenney eliminated United Kingdom's "ShootTheSky" in eighth place for $27,426 when his ace-king proved to be good against his opponent's ace-jack with the board running all blanks. Brazil's Júlio "JúlioFantin" Fantin was the next player to hit the rail in seventh place for $38,786 in a hand against Timofeev. Timofeev min-raised from the hijack with king-ten and Fantin defended from the big blind with ten-eight. Fantin check-raised all-in with two pair on the eight-six-ten flop and got a call from his opponent with top pair. However, luck was not on Fantin's side as his hand was counterfeited after queens appeared on both the turn and the river. Timofeev was at it again winning a race holding ace-king against Bulgaria's "terror777727" (sixth place - $54,852) who held pocket-queens after an ace hit the flop. However, big-slick wasn't kind to Timofeev the second time around. He got it all in again with ace-king against the pocket jacks held by Denmark's Richard "a Bull 67" Loft. Timofeev was unable to improve his hand and hit the showers in fifth place for $77,573. Kenney was the next player to exit the tournament in fourth place for $109,704. The hand began with Loft min-raising from the small blind with pocket queens and Kenney defending with jack-nine. Loft bet on a nine-high flop and Kenney jammed all-in. His top pair proved to be no good with the rest of the board unable to improve his hand. Brazil's Matheus "M Cunha G" Cunha was the next player to exit the tournament on a bit of a cooler. He opened from the button holding jack-eight and "KumariOy" defended from the big blind with jack-nine. Cunha fired out a small bet after he flopped trips on the eight-queen-eight flop and got a call from his opponent. Both players checked when a harmless four appeared on the turn. However, a ten appeared on the river giving "KumariOy" a straight. "KumaraiOy" check-jammed a bet from his opponent and Cunha was eliminated in third place for $155,145 after he called. "KumariOy" claimed his first WCOOP title after with an eight-to-one heads-up chip lead against Loft after his ace-nine held against his opponent's jack-ten. While Loft was unable to win the title, he did walk away with a huge second place payout of $219,407, the second largest thus far in the series. Each of the winners of the first four events is in a tie on top of the 2017 WCOOP Player of the Series Leaderboard with 100 points. The leaderboard winner at the end of the series will receive a trophy, $20,000 in cash and a PokerStars Caribbean Adventure package. ... A Low version of the WCOOP kicked off on Sept. 4 with the first four events. Each Low WCOOP event will typically begin 24 hours after the regular version of the event starts. ... United Kingdom's "carpediem200" surpassed $2 million in tournament cashes at PokerStars and $3 million online overall according to his PocketFives profile after shipping the WCOOP-01: $215 NLHE [Sunday Kickoff SE], $300K Gtd for $115,278. ... United Kingdom's "WeakyLeeks" is on top of the Player of the Series Non-NLHE Leaderboard after shipping WCOOP-04-H: $530 NLO8 [8-Max], $200K Gtd for $62,354. ... Each of the first seven events of the 2017 WCOOP has smashed their posted guarantees. PokerNews will be recapping all the action played out during the 2017 WCOOP. Check back daily for updates, news, and more.